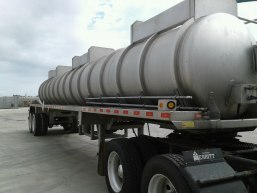 Our liquid vacuum trailers (tankers) are ready to roll behind your tractor or ours, and include both self-contained, 130bbl capacity, 407/412 ASME/DOT-approved and non-self-contained, non-DOT-approved options. 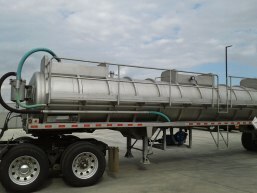 Appropriate for bigger loads, you can economically collect and transport liquid and semi-liquid waste from processing and production sites or municipal cleanup operations. Our liquid vacuum trailers use powerful Fruitland 500 rotary vane vacuum pumps powered by Deutz diesels. Liquid vacuum tankers can transport non-hazardous materials (septic or other natural waste) or hazardous materials (such as petroleum products, or production and process-related chemicals).